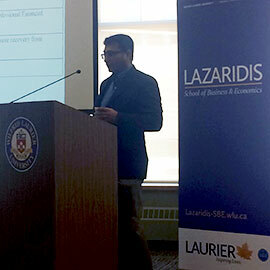 The Lazaridis School of Business & Economics hosted its inaugural Lazaridis School Research Day Nov. 10 on Laurier’s Waterloo campus. The event featured short presentations followed by Q&A sessions from Lazaridis School PhD students and faculty on topics ranging from workplace fairness to food waste, consumer decisions on seeking professional financial advice to evaluating experiential marketing campaigns. Presentations were made by doctoral candidates Alireza Azimian (PhD Operations and Decision Sciences ’17), Abiodun Isiaka (PhD Accounting ‘18), David R. Lewis (PhD Marketing ‘17), Francisca Saldanha (PhD Organizational Behaviour and Human Resources Management ‘18) and Kostia Sokolov (PhD Finance ‘17). Saldanha is investigating how to enhance resiliency to promote recovery from workplace unfairness and has realized how important perceptions are because emotions aren’t objective. “Workplace unfairness has profound impact on employees,” she said, though it also costs their employers: $64 billion is spent on turnover every year in Canada due to unfairness. How can companies begin to promote recovery? Saldanha stressed the importance and role of resilience in the aftermath of and during the recovery process from workplace unfairness. There were also presentations made by Associate Professor of OB/HRM Laurie Barclay, Assistant Professor of Finance Michael Brolley, Associate Professor of ODS Victor Shi and Assistant Professor of Marketing Sarah Wilner, all Social Science and Humanities Research Council (SSHRC)-funded faculty that were sharing the initial stages of their newest research projects. “Forty percent of food is wasted in Canada,” said Shi, who is researching sustainable operations through product philanthropy. This wasteful problem creates three concerns: economical losses, environment damages and the moral impact due to the number of people who experience hunger and food insecurity. However, Shi’s research is studying what may be a practical alternative: a food waste inventory donation program, which could lead to an improved triple bottom line for companies. Wilner is researching the means of evaluating experiential marketing campaigns and the impact they’re having on consumers today. “You need to let consumers do the talking,” she said, before highlighting examples of consumer brands that have produced successful viral campaigns. These “extraordinary or elevated experiences,” as Wilner calls them, can create buzz and unleash emotional connections to brands but they also can be quite expensive and risky for a brand’s identity.